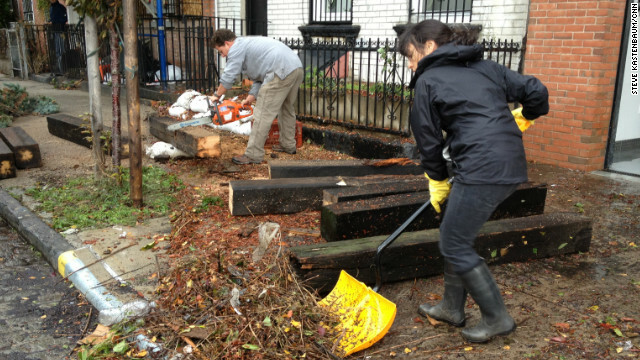 Jeremy Armstrong cuts up the timbers while a friend shovels debris in front of his home in the Red Hook section of Brooklyn. (CNN) – At the height of Superstorm Sandy, the neighborhood of Red Hook in Brooklyn was indistinguishable from the waters of New York Harbor. Jeremy Armstrong returned to his home there Tuesday to survey the damage, and get to work. His house is two short blocks from the waterfront. As he cut timbers with a chainsaw, neighbor Megan Davidson washed away a mixture of sea water and sludge from a garage. Armstrong is hoping that Sandy was a once in a lifetime storm. Editor's Note: Listen to the complete story about the cleanup effort in the player above. 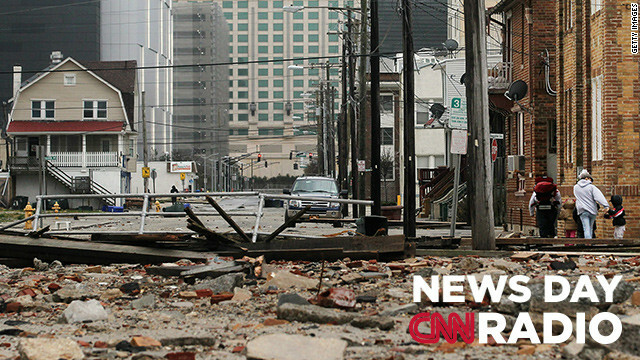 A large section of the "uptown" boardwalk in Atlantic City, New Jersey was destroyed by Hurricane Sandy.